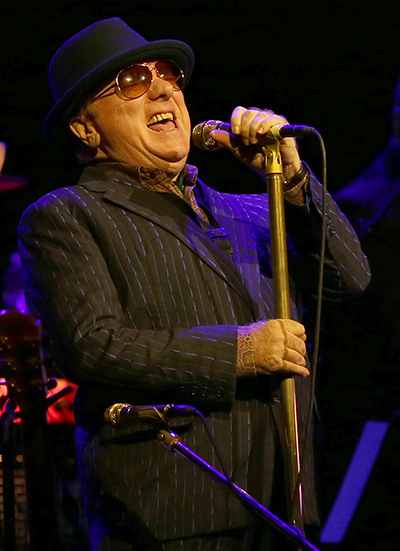 A rare tour by singer-songwriter Van Morrison made a stop at Oakland’s Fox Theater on Monday night with the knighted 70-year-old Belfast native delivering a stellar set that delved deep into his half-century-old resume of hits while bridging rock, jazz and soul to provide a performance for the ages. The 90 minute concert, the first of three sold-out shows at the ornate venue, began promptly just moments after its scheduled 8 p.m. start, with Morrison following his five piece backing band onto the stage with an alto sax for the instrumental “Celtic Swing,” before launching into “Close Enough For Jazz.” Sharply dressed and looking dapper in his customary suit, wearing shades and a cool black fedora, it was a treat for those in attendance to get to experience the extraordinary voice of one of music’s most soulful jazz singers in such fine form. Morrison, a 1993 inductee into the Rock and Roll Hall of Fame, has a mercurial reputation. While his repertoire is extensive, like his fellow living legend Bob Dylan, the Irishman has often been known to play shows that, while still enjoyable, leave the audience somewhat scratching their heads at the end of the evening because of the dearth of his most recognizable hits. That was certainly not the case on this evening as the Irishman dug far into his vast catalog while still delivering a number of classic cuts. “Sometimes We Cry” and “That Old Black Magic,” a pair of duets with daughter Shana Morrison followed. Next came a powerful rendition of “Baby, Please Don’t Go.” Originally recorded with Them in 1964, his first band to receive international recognition, the Muddy Waters blues standard was presented with the improvised lyrics, “God put me on a farm for the rest of my life, all I done was shoot my wife,” as Van The Man energetically reworked the classic with synthesized vocals and harmonica while conducting his band at key points for added emphasis. Such was the productivity of Morrison & Them that at the time of its release the single’s B-Side was “Gloria,” since covered by talents ranging from Jim Morrison and The Doors, to Jimi Hendrix, Patti Smith and Tom Petty. Not bad for an afterthought. Continuing the bevy of hits, the fantabulous “Moondance” followed, setting the stage for a stellar 12 minute finale of the aforementioned “Gloria” which segued back and forth with “Who Do You Love,” further propelled by the soulful backing vocals of Dana Masters. Having just seen Patti Smith perform “Gloria” on New Years Eve, it was difficult for this reporter to imagine a better presentation, but it’s very hard to even remotely dismiss such a fine rearrangement of the original. Coming just hours after the announcement of the death of Eagles co-founder Glenn Frey, and just over a week after the even more shocking passing of David Bowie, preceded by losses in just over a month of Scott Weiland, Natalie Cole and Lenny Kilmister, it was not only a pleasure but also highly cathartic to experience this international icon, a true master of his craft in such fine form.